He may have left the White House, but he is still very much on President Donald Trump’s side, it seems. 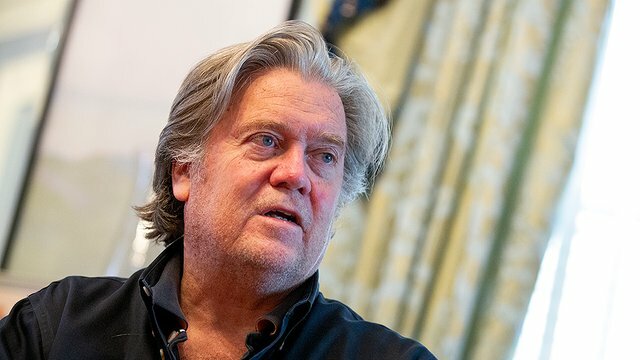 Former White House chief strategist Steve Bannon announced on Wednesday the soon to be released new pro-Trump documentary he made, along with a new political group before November’s midterm elections. The documentary titled “[email protected]” will be released in September, which will coincide with the second anniversary since former Democratic presidential nominee Hillary Clinton described Trump supporters as “deplorable”, which in turn only succeeded in boosting their support for the Republican nominee. “[email protected]” documentary is said to present Trump as a hero and the president’s detractors as villains, starting off with a scene that shows liberal protesters violently attacking Trump protesters. Bannon is also planning to challenge, and limit, Democratic control of the House with a media blitz of pro-Trump messaging on cable television, editorial pages of local newspapers and right-wing radio shows. Bannon also said his group will advise Trump surrogates and assist them in drafting and enhancing talking points ahead of the general elections. The new political group also includes former Trump adviser Sam Nunberg, former Trump campaign strategist Michael Caputo and pollsters John McLaughlin and Pat Caddell, who is also close to Bannon. The strange thing is Trump and Bannon are said to be no longer speaking but Bannon has over the past several months sought to closely align himself with Trump, nonetheless. Hopefully Mr Bannon will get a msg to POTUS about the international money landering terror funding website called 'launchgood' . I dont need to type it out but it seems like the same trick hillary n s0r0s operatives were able to send p strozk between 350 to 500k USD the day he was fired via go fund me.. Laundering even, checkout the campaign on LG for the new mexico compound terrorists. Makes me sicker than watching strozk take a bribe from halfway across the globe. Good for Steve Bannon, at least there's some honest media left! Bannon's fantastic , keep up the great work . Now if we can only get the voter fraud under control.